There isn’t anyone on the planet who can deny the pleasure of watching a good Rube Goldberg machine. For those of you who don’t know, Rube Goldberg was an American cartoonist, often referred to as the “father of invention” for his series of comics depicting what we call Rube Goldberg machines: Complicated, deliberately overengineered contraptions that ultimately perform a very simple task. Ironically, they’re rarely (if ever) built by rubes. One step triggers the next in a chain reaction until the final task is complete. Once it starts, it’s practically impossible to peel yourself away from the anticipation of what’s coming next. From Japan to the United States, Goldberg contraptions have flooded cultures around the world in commercials, contests, movies, and TV shows. 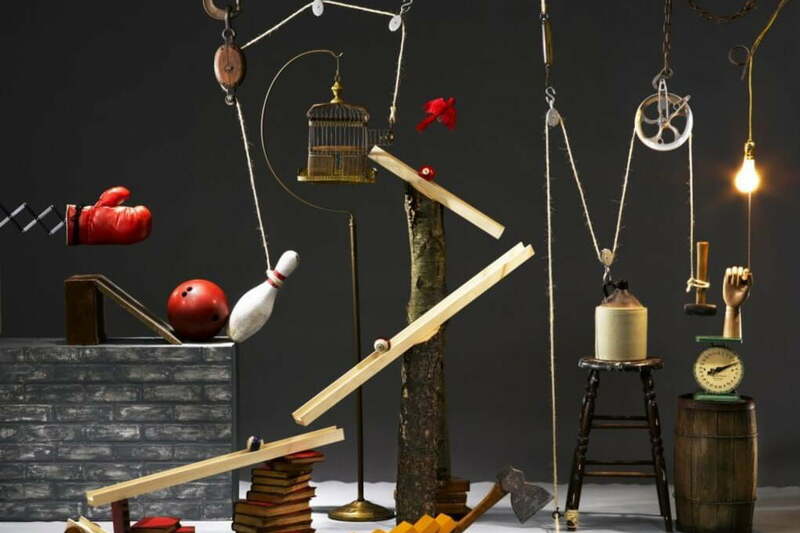 We’ve put together a collection of some of the best Rube Goldberg machines, apparatuses, inventions, and devices that will blow your freakin’ mind — one domino at a time. If you like these, check out our picks for the coolest Lego machines. What’s the fastest way to make lemonade? Definitely not by using this machine, which weaves its way through what seems like an entire house and even out into the yard. Watching the 9-minute video is an exercise in patience, not just for the viewer, but presumably the crew involved in making and filming the machine. At one point, the slow drip of goo necessitates a time lapse, the camera waiting dutifully. One shudders to think about the possibility of a ball rolling slightly off path three quarters of the way through, requiring a full reset of the long and extraordinarily complicated contraption. For sheer scale and ambition, the Lemonade Machine is a spectacular feat. You need a mere three ingredients to make a bowl of cereal: Bowl, cereal, milk. It’s the mark of a great Rube Goldberg design that the process can be stretched across three acts. The Purdue Society of Professional Engineers did just that with their first-place entry at the 2018 Rube Goldberg Machine Contest at the Museum of Science and Industry in Chicago. The machine is essentially a rotating triptych; three vignettes, each given a fantasy aesthetic. The first, at the end of its complex mechanism, places the bowl, the second pours the cereal, the third the milk. It’s a dazzling display of engineering, bolstered by an enchanting theme. When hunger strikes in the dead of night, you have a few options. You could order a pizza from your local chain, or you could build an elaborate, multiple room-spanning machine that will prepare your pizza and probably annoy any roomates you might have. YouTube user DREWuhPicture posted a video of this impressive machine, which dumps sauce and cheese onto a pizza, throws it in a toaster-oven, and then proceeds to distract you with a bunch of cool tricks while the pizza cooks. The Pizza Machine is notable not just for its utility, but for its inventive design, making use of various household objects including a toy train, pool balls, VHS cases, and even what appears to be a Hannah Montana CD. The machine loses a few points for burning the pizza in the video, but given the lack of pepperoni, it was destined to be an underwhelming meal anyway. YouTube user jackofallspades98 has made a number of great machines, but his magnum opus may be the “Bet-losing Machine,” which he made after losing a bet. His punishment was to make a machine that spans two-tables. The machine took four months to make, according to the maker, and involved 297 failed attempts. The final result is astounding, however: A machine of incredible complexity. The two tables are crammed with a dense collection of objects, with numerous mechanisms criss crossing each other, yet every step in the chain flows perfectly. While the machine doesn’t seem to have any theme to it, its technical virtuosity suffices. If you want to see every element in detail, you may need to slow this video down a bit. Even sped up, it lasts for more than four and a half minutes, which seems insane until you notice that the video was uploaded by Guinness as the World’s Largest Rube Goldberg Machine! Crafted by Latvian e-commerce company Scandiweb as a treat for the citizens of Riga (and, of course, for some sweet PR), the machine is unfathomably large, featuring dozens of unique twists and several sections where multiple paths diverge only to come together once more in ridiculous fashion. Other entries on our list may feature more unique themes or ideas, but none are quite as mind-bottlingly detailed. Design studio HEYHEYHEY created Melvin the Machine for the 2010 Dutch Design Week at the MU art space. The contraption uses cameras and videos to record the audience’s reaction while in motion. These photos and videos are then uploaded to Melvin’s social media accounts. This Rube Goldberg machine also creates original works of art during the performance. Melvin’s Twitter has been silent for a few years now, though, the official website did specify that the Magical Mixed Media Machine would be taking an indefinite break from Twittering, Facebooking, and partying. The same design studio behind Melvin the Magical Mixed Media Machine, HEYHEYHEY, also created the newer and much smaller Melvin the Mini Machine. After the success of the original Rube Goldberg machine, the studio was bombarded with requests to take their wonderfully inefficient show on the road. However, the massive unit was simply too big and expensive to rebuild routinely. HEYHEYHEY then decided to create a more travel-friendly version of their original Rube Goldberg machine. This unit is designed to fit within the confines of a pair of suitcases, which work in tandem as part of a larger, more portable performance. Though some of the machines on this list are painfully detailed and long-winded affairs, Toronto-based 2D House kept it short and sweet with this contraption. Gravity has met its match here, as the first half of the process is made to look like your average, run-of-the-mill Rube Goldberg machine (if there even is such a thing) — except it’s being filmed upside down. Once you see the odd flight path taken by the marbles at around the 15-second mark, your brain starts to realize how ridiculous this thing actually is. Instead of the burdensome complexity we’ve come to expect from these videos, Newton vs. Goldberg makes you want to go back and watch it again to try and figure out exactly what’s going on. Six hundred and six takes later, this Honda commercial titled “Cog” first aired in the U.K. in 2003. Hoping to boost car sales, Honda got a team of engineers, car designers, and even a sculptor to design the machine — made up parts from two disassembled Honda Accord cars. The two minute commercial, which only aired on TV a handful of times, cost over $1 million and seven months to film. That said, it proved to be money well spent. The commercial’s popularity skyrocketed in the United Kingdom, hitting the highest web traffic records for the Honda U.K. domain in its history the day after the commercial aired. “Cog” has also nabbed the most awards of any commercial in history to date. No graphics or digital tricks were used in the making of the commercial, despite what YouTube commenters would have you believe. The Chicago band OK Go became an overnight sensation after the release of the music video for Here We Go Again, which featured a treadmill-based dance routine. Since then, the band has become famous for its elaborate videos. To break ground in the music industry for a second time in 2010, the band needed the help of an elaborate Goldberg contraption. The video, cleverly titled This Too Shall Pass raked over 50 million views on YouTube and took over four months to shoot. The enormous contraption flows over two stories of an LA warehouse, making the video’s single, unbroken camera shot quite impressive. The beat and lyrics of the song perfectly synch with each step of the contraption from a falling piano to swinging pledge hammers and everything in between. The team even got the help of NASA scientists for the video that induces some serious gasp-heavy moments. Who could have predicted that your everyday Post-it notes and Scotch tape could make such an eye-catching machine? The people at 3M collected over 25,000 Post-it notes, 300 feet of reflective sheet, 200 pounds of steel, 75 rolls of Scotch tape, and a whole lot more to create this intricate machine made entirely of its own products. It took over 1,400 hours and required input from experts in scientific disciplines like physics, chemistry, and thermodynamics to complete. “The Brand Machine” (as 3M refers to it), like most Goldberg machines, illustrates a larger point: that we might overlook the small things like a Post-it Note that simplify our lives. So after watching this 3M Goldberg machine, you better appreciate your Post-its. “Entertain your brain” is the slogan behind this promotional video by National Geographic and that it does. In hopes to pry people away from their smartphones and back to watching TV, the British Nat Geo team built a four ton Goldberg machine. Using a human loop-the-loop and the entire solar system makes this apparatus the most massive Goldberg on our list. We’re not exactly sure what this has to do with either nature or geography, but it’s awesome anyway. 2D House, making its second appearance on our list, is a photography company that’s becoming well known for its Goldberg photo-themed contraptions. After eight months of grueling work, the photo team debuted this one complete with camera bags, camera, umbrella’s tripods, caps, and lens. 2D also offers a back stage “How it’s made” video in combination with the photo finish. Do you have trouble getting up in the morning? You could try a fancy alarm clock, but maybe a better solution would be an elaborate mechanism that will prep your clothes and make a disaster of your apartment. The YouTube channel Joseph’s Machines features a number of quirky, clever devices, and one of the most charming is the Dresser, a relatively simple machine that is nevertheless entertaining. The video is essentially a skit in which the protagonist wakes up to the sound of his alarm, dumps his clock in a cup of water, and kicks off a sequence designed to help him get ready for work. The piece is notable both for its slapstick, Chaplin-esque humor and for the fact that it appears to consist of a single take. Creator Joseph Herscher spent a year working on the Dresser, and the effort shows. Another superb invention from Joseph’s Machines, the Cake Server solves one of mankind’s oldest culinary conundrums: What if you want a slice of cake after your meal, but don’t want to stand up and serve it yourself? The solution is an ingenious device that incorporates a number of otherwise useless household items like a candle, a stick of butter, and a MacBook. Most impressively, the Cake Server manages to wrangle one of the most mercurial ingredients in any Rube Goldberg machine we’ve seen: A toddler. And while the machine’s design may require you to always have a child on hand when you want dessert, it’s a small price to pay for sweet, sweet cake.